Onward Manufacturing is one of the largest grill producers in the world, and their Broil King line represents some of the best grills for the price on the market. You can cook anything from pizza to special holiday dishes with this simple gas grill. Although the Monarch series is toward the lower end of the line, it's still a great quality grill. First, the size is perfect for the average griller, allowing them to cook several items at once. Second, the heat is even and strong, reassuring chefs that their food will be cooked evenly throughout. Finally, the construction of this gas grill is excellent. This particular model competes with similarly sized products from the Weber brand. Being a basic gas grill with solid construction, the Broil King Monarch is a great choice in a decent price range. Compare this model with the Broil King Signet 20 if you can go without the side burner. The Broil King Monarch has a heavy cast iron cooking grate and stainless steel vaporization barrier that's built to last. We wouldn't be surprised if the durable construction and high-quality stainless steel dual burner keep you grilling for years to come. 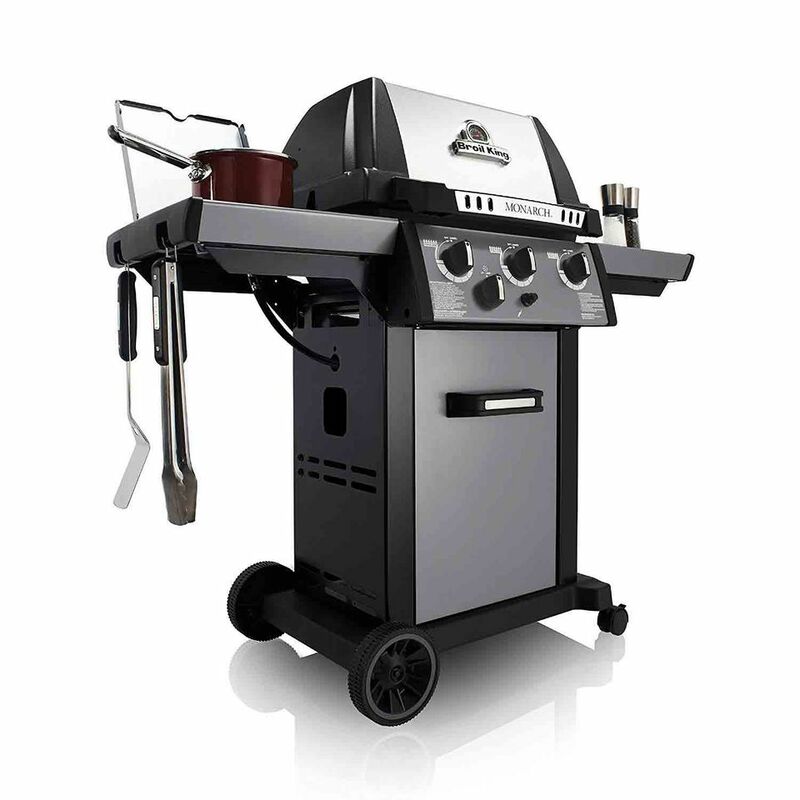 At 30,000 BTUs, this gas grill has enough power for its 350 square inches of primary cooking area. While the power is just a bit lower than some other models, the heavy cooking grates make up for the lower BTU output. Additionally, the Dual-Tube stainless steel burners on this grill are unique and revolutionary. Broil King is particularly famous for their Infinity-8 burner which gives you something no other tubular burner can: even gas flow from front to back. The process involves an inner tube that distributes gas throughout the outer tube. Then, the outer tube delivers a true and even flow of gas throughout the construction. With such an amazing design, grillers will surely impress their guests. With even heating and durable construction, this gas grill has many benefits. The only disadvantage is that there's an underpowered side burner.